or "Tan Those Toes and Other Ways to Deal with Wind on the Water"
One of the most common obstacles to overcome while flyfishing in saltwater is the wind. The longer casts needed on the flats commonly result in many coils of fly line at ones feet as they wait for the fish to arrive. Utilizing proper casting technique while the flyline is in the air is paramount, but what about the coils of line at your feet? If you find yourself having trouble with line management on those windy days on the flats, try taking off those boat shoes. Removing your shoes allows you to feel the line underfoot before you make your cast. Another low cost solution, try swiping your spouse's laundry basket. I haven't found those stripping baskets that are worn around the waist to be very comfortable. They restrict my movement while casting and just feel so cumbersome. If they work for you fine, but if not, try a large laundry basket left on the deck in front of you. Their large opening makes it easier to strip line into while trying to keep your eyes on the fish coming at you. The size of the basket can average from two foot by three foot, and are usually rectangular in shape. They usually have an open weave pattern on the sides so that the breeze can pass through them. The important thing is that you can get the fly line into them without taking your eyes off the fish. I know of a client that straps a smaller one to his poling platform while he's out alone. It holds the flyrod while he poles and keeps the line from tangling around the cables in the motor well when he's casting. There are several other options... one being a "fly line tamer" product, which many of the Key's guides are quite fond of. Though they're a bit more expensive they do the job well. If it is at all possible, your friend/guide should have the boat positioned so that you've got a downwind cast. There are also modifications that can be made to your cast to take advantage of the wind. First, keep your backcast low to the water. The water creates friction on the wind and can actually slow it's velocity. I'll usually sweep the rodtip back low and parallel to the surface of the water, about a foot or two above it. At the end of the backcast be sure the rod tip travels upward with a flick of the wrist. The higher above the surface your rod tip gets, the stronger the wind impacts the cast. Keeping this in mind, make your final downwind cast high and overhead, while opening up your loop just a bit. This open loop will help to catch the wind and "sail" it downwind to your target. This is also a great technique for the wind coming over your shoulder while fishing. 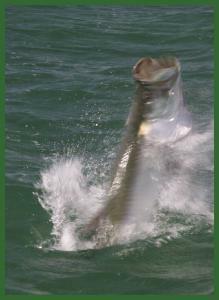 The low backcast and high presentation, keep the fly from catching the skiff, or you in the back of the head! Lastly, if you're without a tool to restrain your flyline, step back a foot or two from the bow and strip the flyline into the cockpit behind you. Be sure the area is clear to prevent snags on any gear bag buckles, shoes or cooler handles. If it's really cranking, it might be helpful to stand in the cockpit until the guide spots the fish for you. Try these methods and don't forget to use sunscreen on those toes, or ya might end up looking like an old seasoned Islamorada guide!